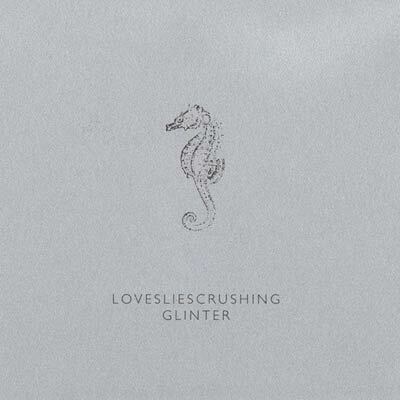 Without too much love for spaces between words, Thisquietarmy records releases “Glinter” by Loveliescrushing. Three tracks, each lasting more than twenty minutes, stretch together a very sharp line between three different chasms of beautiful sounds. “Broken Aureate Echo” begins with the sublime, mind soothing, yet sharp walls of sound. Many ideal ideas emerge from these dense sounds. I can hear the distant ballroom music phasing into massive thunders and descending tones. This galaxy of echoes bombards my ears with particles of sonic joy and clouds of despair in the form of audio waves. When it’s done, we dig deeper into the rabbit hole. “She is Above the clouds” surprises me with the vague singing. Through the deep drones, I try figure out whether I am hearing a trapped mermaid or an alluring Banshee and either way, I am mesmerized by this spectacle. She is spiraling inwards and outwards at the same time, and I am pulled inside out and back again from her magic. She stops for a brief moment, and I feel like I have lost something amazing, and through my despair over my loss, I try to recreate her voice in my mind. As if to answer me, she comes back through the speakers, only now she is more twisted, more of a banshee than anything else. Her voice makes me dizzy and almost paralyzed as I listen to her gliding gracefully over the dark ground of rumbling drones. The third part, “A Bird Flew to the Sun”, combines the two monumental parts of the earlier tracks, the towering walls of sound and the only voice that can penetrate them with enough grace and dignity, to create the humbling, ultimately crushing the listener with enough force, yet enough gentleness for the listener to thank Loveliescrushing at the end of Glinter. I will happily do that. Thank you!